In an interesting piece about bacteria and oyster disease, (See probiotic oyster lobster article here. )we came across this nugget about oysters in Rhode Island. With oyster aquaculture now one of the state’s fastest-growing industries, there is a lot at stake in keeping oysters healthy. New statistics due to be released in the coming days by the Coastal Resources Management Council show the economic value of the harvest of farmed oysters grew from $4.2 million in 2013 to $5.2 million in 2014, an increase of nearly 24 percent. Oysters are now a bigger product than quahogs in the Ocean State. As to the Bacteria- that is interesting too. Eastern Oysters are vulnerable to many pathogens, including a natural-occurring bacterium, Vibrio tubiashii, that kills them when they are still in the larval stage. Oyster larva swim for several weeks before attaching to a surface, and it is during that earliest stage when they are most vulnerable to vibrio tubiashii. After considering different ways to try to prevent the bacterium from killing oyster larva, Rowley tried probiotics because they were sustainable, easy to use and inexpensive. 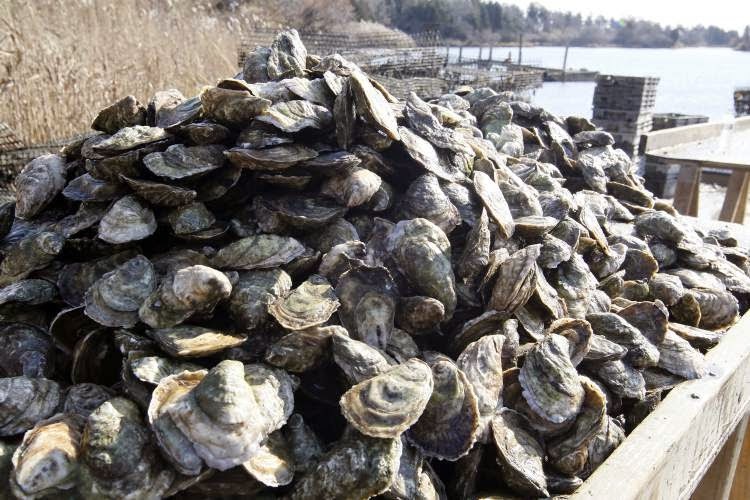 Rowley and his colleagues screened about 100 different bacteria before finding two, both from the Narrow River in Narragansett, that seemed to protect young oysters. After testing them in tanks at the Blount Shellfish Hatchery at Roger Williams University, the team developed a way to grow the probiotics and freeze-dry them so they could be stored for several weeks in a refrigerator. They can then be added to the tanks where oyster larva are growing.